That’s not the Broadalbin Promenade you’re seeing. It’s a sidewalk expansion. Changing the names is one thing. Getting any of these projects actually started is something else. All three of these now former esplanades would make old Albany more interesting as a destination, and for residents too. 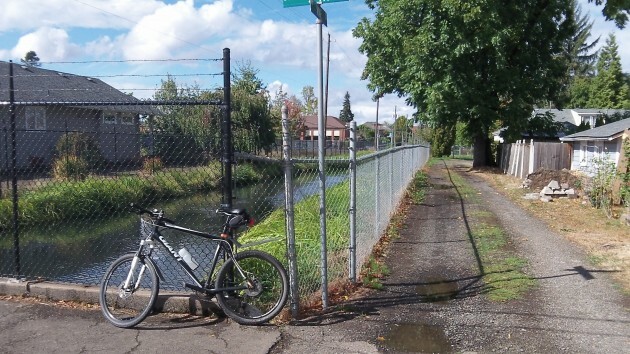 Especially along the Thurston Canal, improvements would dress up a whole neighborhood. That plan calls for reopening the canal (buried in a pipe in the 1970s), and increasing the flow, among other things. If there’s ever a pleasant walkway all along the Santiam Canal, don’t call it an esplanade. If that’s the council/board thinking…that it’s the names we are critical of, then they are truly misguided. They can call something the “Stairway to Heaven” for all I care. It has everything to do with the wise expenditure of PUBLIC money. Nothing else. One more thing….they’d best settle on these names before those outrageously expensive signs are made, or we’ll be coughing up a princely sum to change them. The use of a euphemism simply substitutes one word for another. It’s an attempt to avoid embarrassment or ridicule. But a euphemism can’t hide a pig. Changing “promenade” to “sidewalk” simply puts lipstick on the pig. The underlying embarrassment still exists. Let the ridicule begin again. Marketing. Not necessarily a bad thing. What may be interesting is that the “frou-frou” names that were used before are the kinds of descriptions that have been used my many businesses, and cities, to create a sense of the “new” being accomplished. A change that brings excitement. Marketing. The new names are more utilitarian, or more “engineer speak”, that describe the basics without characterizing the newness and change that will occur. Another kind of marketing. All this results from the incessant attacks that have come from a few loud folks over virtually everything that government does, especially CARA. I think it’s not really even about money or taxes even though that often gets cited. I’s about hating any change. But, as we all know, if you don’t change and adapt to the world, you probably won’t survive, or at least not very well. If you don’t go out and get that better job, you family stagnates. If you don’t convince your kids to get that college degree even thou you didn’t, then they probably won’t be able to keep up with the changes in the world we all know are coming whether we like them or not. All across the country small towns have been disappearing. The disappear because small family farms can no longer compete against more cost-efficient larger operations. They disappear because their streets crumble, their water pipes leak, and businesses leave because nobody wants to shop there any more, and they’re not willing to spend the money to fix things up.. They disappear because their young folks leave because of a lack of opportunity, or because it’s a dreary and decaying place. It’s not just about downtown in Albany. It’s about not being able to keep stores open at the mall. It’s about Kmart closing. It’s about vacant spaces in the neighborhoods, or stores that don’t keep up their appearances because they can’t afford it. The only thing that can reverse these changes is even more change. Cultivating change that brings progress to your city is the hallmark of all the great places whether large or small. They cherish entrepreneurs, keep the infrastructure running, and welcome all comers, not just those few who meet a narrow entrenched view of only allowing the right people. Those cities and places are progressive, looking forward not back. Woods: “I think it’s not really even about money or taxes even though that often gets cited. I’s about hating any change.” Pure, unadulterated baloney, Woods. Now you’re a psychiatrist? Not baloney. More like a dose of medicine to help cure the sickness you and others spread. Government is not a thing, it’s us. Albany has worked together through their government to assist others in rebuilding what was a decaying place. You and you kind oppose that. You, Gordon and the others say that government should have no role in doing that. That government steals your money from you. That regulations made to help reduce conflict between peoples should be abolished. And the list goes on. You deny the rights granted under the constitution that allows people to form the governments they have today to try and change things to make their lives and community better. Rights that were made by the people, for the people. Rights, activities, regulations and procedures that the courts have upheld as being consistent with our state and federal constitutions. You deny those rights for the people to make change by way of their government. CARA proves it’s not about money because CARA never created any additional tax. CARA gut moved existing taxation from one set of uses to another. CARA changed things James. And you and the others continue to oppose that change. I guess one thing that do seek to change is the makeup of the elected leaders of the city. But your candidates just continue to lose. Over and over again. So I guess we see that the ongoing majority of Albany voters also oppose some change, when they see that it would make their lives worse. Being an advocate of smaller government at all levels is now a “sickness?” Invoking the Gettysburg Address in defense of CARA? The psychiatrist speaks again. So now it’s lipstick on a swine? Either you get it or you don’t . The few people that comment here on a regular basis don’t obviously . Make Albany a place for small business owners as well as large corporations to invest in is the goal . Albany has had a long history as a lesser community and the Millerburg “smell” has been gone for a long time but others within our state remember Albany as that place . Downtown as I know it when moved here 14 years ago is night and day what it was . I don’t care to eat at chain restaurants that have manufactured food . When I moved here that is what 90% of the choices where . Our downtown has turned into a vibrant place to visit . Meeting with a planner from Corvallis the other day he said he was very impressed and envious . Good thing those that post here aren’t the ones that investing millions in our city . I guess the money people are a tad shrewder than the “1% unhappy people” here . Dave, Perhaps in the interests of full disclosure (and context) it would be good of you to identify yourself as a CARA board member from Ward 1. If you think downtown Albany is vibrant now, you should have seen it in the 60’s and 70’s when it WAS a thriving environment for all kinds of businesses, shops, and restaurants…..with none of the “propping up” with tax money that’s the case now in many instances. What you call “vibrant” bears no comparison to what the downtown once was. The big change came with the creation of the shopping centers on Santiam where you’re employed, and the Heritage Mall. Good planning? In hindsight, no. And the “shrewd” money people you cite are lining up for the “forgivable loans” your board doles out to people that have (in many cases) the capital to do some of these projects free of CARA. Baldwin Construction’s remodel of the blight that was the Salvation Army Thrift Store would be a shining example. There are many more of us “out here” that oppose much of what CARA does than the 1% you are claiming. Government isn’t the answer, Dave. Private enterprise is what made this nation great. To clarify, Baldwin Construction’s remodel was done without CARA assistance. My apology for any confusion. Kudos to Mr. Baldwin. The building now looks great! CARA takes revenues from the overlapping taxing districts without their permission and spends the money to service its debt so10 percent of the city benefits to the detriment of the other 90 percent. And CARA does all this without voter approval. Thank goodness M22-116 changed the City Charter to make sure voters will have the final say on future urban renewal districts. Every downtown in the US was transformed in 70s and 80s due to changing patterns in which people sought out services. It’s not unique to Albany. College towns typically don’t have as big an issue. 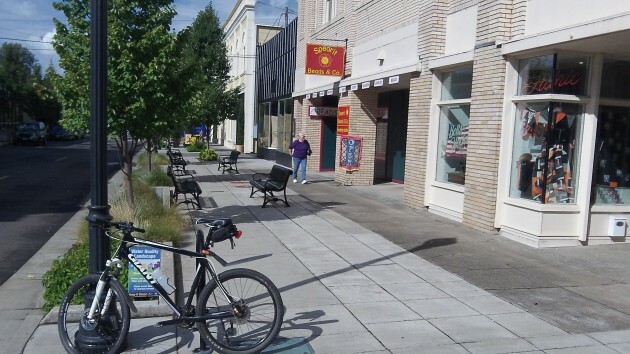 Corvallis downtown is an example. Eugene and Palo Alto as well. I’ve lived near both. Any successful downtown in current times needs to offer something people can’t get elsewhere. Financing businesses in old buildings is not for the faint of heart. It requires many avenues of financing. What CARA does is fill these gaps and without it none of what you see downtown would have ever occurred. Just the fact that I see posts refer to Albany as a pig & CARA as lipstick tells me that people perhaps don’t like Albany. That’s very sad. It’s a great place to live. I’ve posted here before. Full disclosure: I’m a CARA board member, a Landmark Advisory commissioner and a Manager at Fred Meyer. I donate a lot of time and energy to the town I love. Albany has one if the richest histories in the state. I would hope residents here support the carousel. A lot if good dedicated people volunteered hours and sweat to this project. What will downtown look like in 2-3 years? Look around the state. Go to Bend. I ate dinner there tonight. Wow, what a downtown! McMinnville? Corvallis? What makes these places great? The people do, I feel. Dedicated to make a place more livable. I don’t think other towns have as much an opposition to making places more livable as Albany does. You’ll hear my voice on here more often. If you’re ever in FM, look me up. I’ll buy you a cup of coffee :) I know I’ll never change anyone’s mind. But knowledge is power. Albany was named the hub city back in the day. It’s still a very important community. Just to set the record straight, you misinterpret some things here. The “pig” comments aren’t in reference to Albany, but rather in reference to CARA and the tax increment financing concept. The “lipstick” is in reference to what Woods calls “marketing.” Perhaps propaganda would be more accurate. We realize we’re “stuck” with CARA until it expires but if you think we are going to be quiet and be good little minions when we think a project is wasteful of public money, you are mistaken. Nobody is saying Albany isn’t important. We just differ on how to make it better. Thanks for not getting personal about this. Woods could take quite a lesson from your demeanor. I may take you up on your offer of a cup of coffee :-) Woods won’t get the time of day from me. A very sophomoric comment. You simply parrot the Mayor’s “we love Albany more than you” silliness. Just like no one has a monopoly over the truth, no one has a monopoly over who “loves” the city. I don’t question your “love.” Please don’t question mine. I think we share the same sentiment, but very different attitudes about the role local government should play in the process. And your comment that without CARA “none of what you see downtown would have ever occurred.” Another sophomoric comment. CARA is nothing more than a guessing game. Nobody knows if the guess was correct because there’s no way to tell what might have been. Finally, nobody called Albany a “pig.” CARA is the pig. It’s “investments” are the lipstick. Your attitude, as revealed above, is more evidence of the extreme arrogance so common with CARA. CARA violates the will of the people. More on this in my next letter to the DH. IF you are a member of any entity that doles out “the peoples money”, you should resign. I don’t recall seeing any blood on the signatures of the taxing districts reperesentatives signing off on the the URD. The community has improved immensly because of the entire TIF process. You and a handful of others simply don’t like the process by which it came aboout or is administered — regardless of the outcomes in Albany, Lebanon, Oregon, etc. I get that. I get you don’t like representational government — if the results of which don’t meet your approval. It’s that same “sliver” of eligible voters that voted you and the other council members in. Let’s not forget that. Yes people need to agree to disagree . I never have blindly followed others quite the contrary . But man really did land on the moon and it wasn’t staged . I don’t follow the tea baggers theories sorry . I have no doubt those that post here understands TIF. The conjecture of “what if” you’ll never know . Always look ahead I say . But 35 years in real world retail tells me ALL downtowns had a broken business model . From my earliest memory growing up and seeing how people shopped through the 60s, 70s, 80s. Again Albany isn’t unique . There are 49 states using this creative financing method to ensure their cities don’t end up like what Albany was when I moved here in 2002 . I think the courts decided what is & isn’t legal . You can wait till 2026 when it expires and make sure it doesn’t happen again . I’ll be 63 . Just like your insulted from my inferring you don’t love Albany I don’t play that game with the same inference I’m stupid . Reminds me how the crusades went in Middle Ages for those that felt there was only one way to see the world . The world is a very big place with many different ideas . 1% of Albany is 515 people . I only see 3-4 post here . By my count, there are more posting here that oppose CARA than support CARA. So much for THAT assertion. The “tea bagger” comment? What brought that on? Are you really saying “we” don’t think Neil Armstrong and the other 11 astronauts actually walked on the moon? On second thought, I’ll pass on that cup of coffee.